This is a common, large, brightly colored mushroom. It is found on the ground in hardwood and mixed hardwood and coniferous forests in the summer and fall. It grows on the roots of spruces and other conifers. When young the cap is convex. There is a depression at the center of the cap and the margin is rolled inward. It is yellow-orange to orange with numerous purplish or saffron blotches, and may have concentric rings of color. It is dry, smooth, and 1½″ to 6″ in diameter. It exudes a carrot-colored latex or “milk” that does not change color. It is sticky or slimy when wet. As it ages the cap becomes broadly funnel-shaped. Older caps are irregularly tinged greenish. The gills are pinkish-orange to saffron when young, becoming orange, then pistachio green at maturity. They are crowded and attached to the stem, running down the stem on mature mushrooms. The stem is orange, smooth, short, stout, 1¼″ to 2⅜″ tall, and ⅝″ to ¾″ in diameter. It becomes hollow when it ages. The flesh is pale yellowish. The taste is mild. The spore print is pale ochre. Lactarius thyinos has orange milk and does not bruise green. This abundant mushroom is a culinary pleasure, can be dried and pickled. 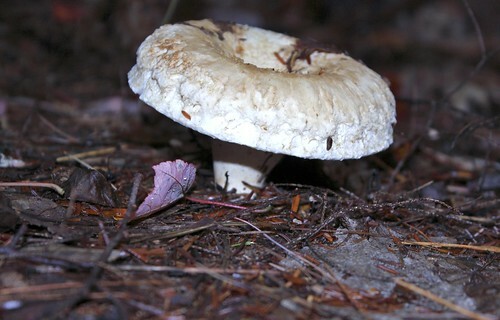 found under dense stands of balsam fir. I've found these for a number of years in the area, typically while hunting hedgehogs.